An open-source camera could change the way we take photographs. 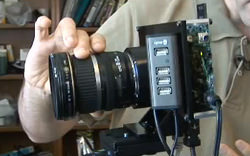 Photo scientists from Stanford University want to "reinvent digital photography" with their open-source digital camera. The team hope the camera will encourage programmers around the world to create software that will "teach cameras new tricks." The Stanford camera means we will no longer just have to use the pre-installed software that comes from the manufacturer. Almost all the features on this new camera are controlled by software that can be created by anyone. Creators of the Stanford camera (dubbed Frankencamera) imagine a future where users can download applications similar to the way iPhone users do from Apple today. The Frankencamera consists of a Nokia N95 mobile phone camera module, a couple of lenses, a circuit board and Linux. The current prototype is made from parts borrowed from other camera and off the shelf parts – hence the name. So far, the researchers have made their creation take HDR images and they are working on enhancing the resolution of videos with high-resolution still photographs. They are also considering the possibility of having the camera communicate with computers on a network, such as a service which hosts photographs. After the camera has reached a satisfactory level of development, computer science professor, Marc Levoy hopes they will have the funding in place for an outside manufacturer to create the camera, for less than a $1000. The project has received support from Nokia, Adobe Systems, Kodak and Hewlett-Packard. A video about the camera can be found on ePHOTOzine.TV. [link=https://www.ephotozine.tv/video/stanford-photo-scientists-are-teaching-the-camera-new-tricks-1384]The video is well worth a look...[/link] Fantastic stuff. The video is well worth a look... Fantastic stuff.